TLC Pulls '19 Kids And Counting' Amid Reports Of Star's Sexual Misconduct As Minor : The Two-Way Reports say Josh Duggar, 27, molested five underage girls in 2002 and 2003. Duggar has apologized, and his family says they have been open about "one of the most difficult times of our lives." 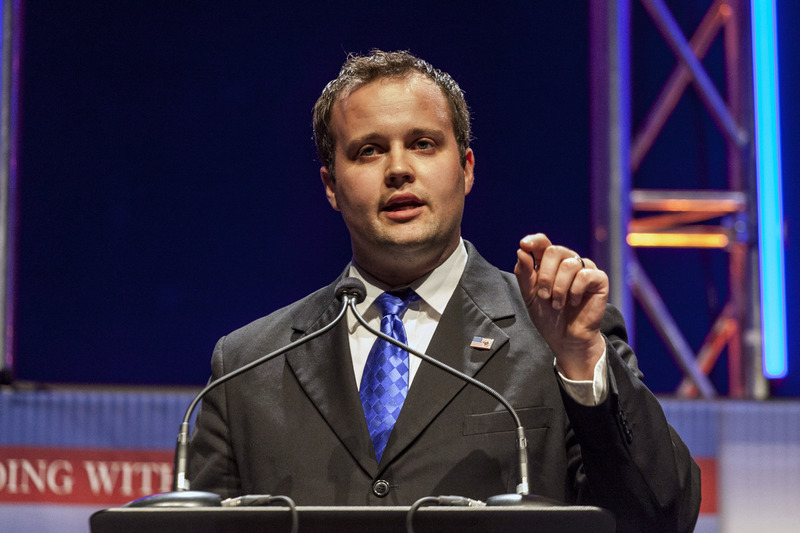 TLC said Friday it has pulled all episodes of the long-running 19 Kids and Counting after reports surfaced that Josh Duggar, seen here in August 2014, had molested underage girls as a teen. TLC has pulled 19 Kids and Counting, the reality show featuring Jim Bob and Michelle Duggar's family, from its schedule amid reports of sexual misconduct against John Duggar, their oldest son, when he was 15. "Effective immediately, TLC has pulled all episodes of 19 Kids and Counting currently from the air. We are deeply saddened and troubled by this heartbreaking situation, and our thoughts and prayers are with the family and victims at this difficult time." "Twelve years ago, as a young teenager I acted inexcusably for which I am extremely sorry and deeply regret. I hurt others, including my family and close friends. I confessed this to my parents who took several steps to help me address the situation. We spoke with the authorities where I confessed my wrongdoing and my parents arranged for me and those affected by my actions to receive counseling. I understood that if I continued down this wrong road that I would end up ruining my life. I sought forgiveness from those I had wronged and asked Christ to forgive me and come into my life. I would do anything to go back to those teen years and take different actions. In my life today, I am so very thankful for God's grace, mercy and redemption." His wife, Anna, also posted on Facebook, saying her husband had told her of his actions two years before he asked her to to marry him. Jim Bob and Michelle Duggar called the period of the reported events "one of the most difficult times of our lives." Amid the allegations against him, Josh Duggar resigned Thursday as executive director of FRC Action, the tax-exempt arm of the Family Research Council. The Associated Press adds that Arkansas police said today "they had destroyed a record outlining a nearly decade-old investigation into Duggar." The Northwest Arkansas Democrat-Gazette, which obtained the record, said this week no charges were ever filed against Duggar because "investigators concluded the statute of limitations had expired." "Springdale Police began investigating Duggar in 2006 when officers were alerted to a letter containing the allegations that was found in a book lent by a family friend to someone else. "The report, originally published by tabloid In Touch Weekly [May 19], states that a member of Harpo Studios, the producer of Oprah Winfrey's then show, received an email containing the allegations before the family was set to appear in 2006. The tipster warned producers against allowing the Duggars on the show and studio staff members faxed a copy of the email to Arkansas State Police." Josh's father, Jim Bob Duggar, served in the Arkansas House of Representatives from 1999 to 2002. He ran for the U.S. Senate twice, but lost both times in the GOP primary. Arkansas lawmakers rallied around the family today amid the report. GOP presidential candidate Mike Huckabee wrote on Facebook that he and his wife "affirm our support for the Duggar family. "Josh's actions when he was an underage teen are as he described them himself, 'inexcusable,' but that doesn't mean 'unforgivable,' " Huckabee said. "He and his family dealt with it and were honest and open about it with the victims and the authorities. No purpose whatsoever is served by those who are now trying to discredit Josh or his family by sensationalizing the story."